We attended the Manchester Pet show last weekend as part of our efforts to educate the public on what rabbits need to lead the lives they deserve. We had been in communication with the organisers beforehand because we had concerns that breeders were going to be in attendance using the dreadful show cages. This was not a breeders’ show, it was for the public, and we were keen to stress that rabbits being displayed in small show cages does not set a good example for anyone owning, or thinking of owning, rabbits. We asked that there would be NO traditional breeders’ cages at the event, and that floor pens would be used, with bolt holes provided so the rabbits would have somewhere to go to relieve the stress of being in a noisy environment with large crowds of people. We also provided text for posters that the organisers agreed to display around the breeders’ area to advise the public that these were breeding displays and that pet rabbits should not be kept in these conditions. We were given assurances that all of our requests would be met. Upon arrival on the day before the show it became clear that the reassurances were not valid and that the rabbits would be exhibited in show cages. We once again spoke to the organisers, were told that some floor pens would be provided for the show, and that the rabbits would be rotated so none spent the whole weekend in a show cage. On the morning of the show only one small floor pen was provided, in which was housed a single giant rabbit, and the rabbits were not rotated. We were bitterly disappointed that we were misled by the organisers. As a damage limitation exercise, we hastily cobbled together some handwritten signs to try and make the point to the visitors that rabbits need space, exercise and companionship but were devastated not only for those rabbits being kept in unsatisfactory conditions at the show but also for the message it sent out to the public. The last straw was when it became clear that the breeders were ‘trancing’ rabbits (holding them on their back which induces tonic immobility, a stressed and panic state in which the rabbit plays dead) for the amusement of the visitors. We were disgusted by this and complained immediately, and it was stopped. However, we fear that anybody coming away from that show who saw it happening will think it’s an acceptable practice. 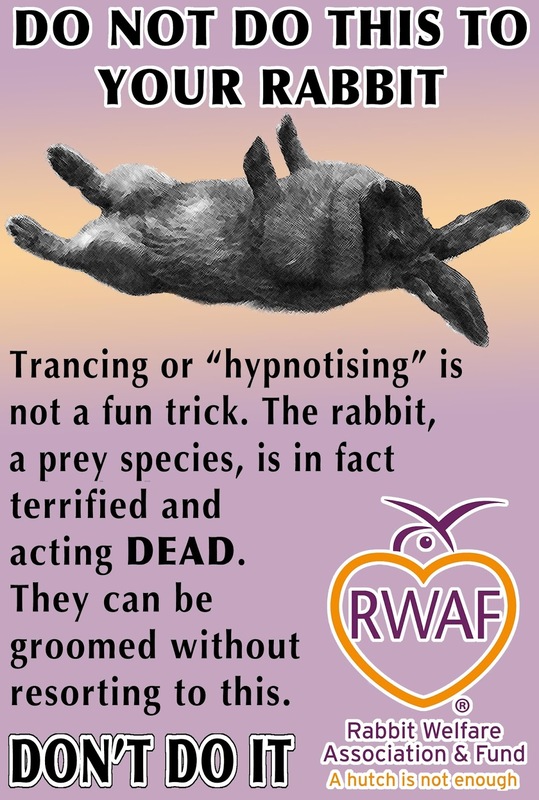 So, please share this poster which makes the point that trancing rabbits is hugely stressful for the animals, not at all fun and not something that should be carried out. 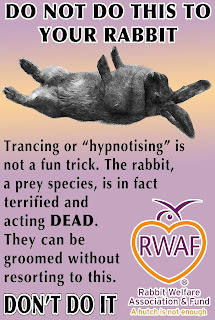 Please see our blog http://rabbitwelfare.blogspot.co.uk/ for more details on trancing.